Thinking you’d like to have a large family, but a little worried you might not be up to the task? Or maybe you already have a large family and are feeling overwhelmed? 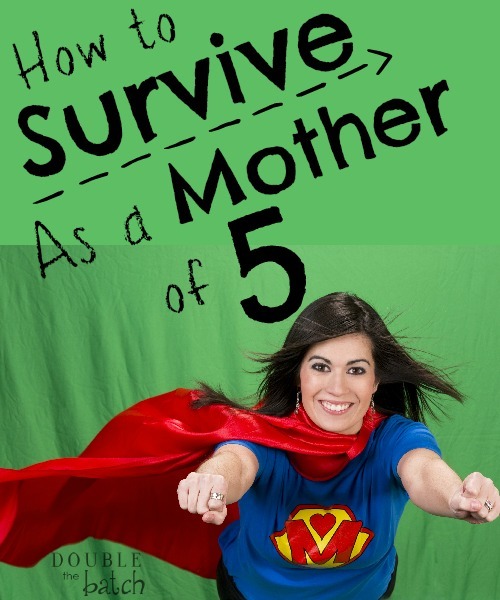 I very recently became the mother of five children (ages 11, 8, 5, 2 and new) so, I thought I would share with you my advice on how to survive as a mother of 5 (or less) children, because come on- I’ve been at this three whole weeks. Of course I’m an expert on the subject! What? Not convinced? Well, did I mention I changed no less than 120 diapers in the last week alone, kept up on my laundry, and helped my kids with their homework almost every night… Ok, so maybe we ate Little Caesars twice… and there might have been some cheeseburgers in there as well. But, I cleaned my shower! No, seriously. I did. And that has got to be worth something right there. I mean, the rest of the house was kind of a wreck. But, my shower? Sparkling. Wanna know more? Yeah- I thought so. Childproofing was easy, though. I mean, all I had to do was put a lock on the refrigerator, the dishwasher, the drawers he would pull out to climb up on the counters, and the cupboards with dangerous chemicals in them, as well as doorknob covers on the bathrooms and creepy fruit cellar basement door, and a child gate in front of my pantry. No problem, right? And as long as I lock my doors to the outside world, and lock my baby in my room while she is sleeping so he can’t love her to death, we are good. Totally good. 2- Let go of the idea that your house should be clean all the time. No, seriously, get over it. It ain’t gonna happen. If your house, or at least part of it, is clean for longer than a 15 minute period during the day or night- pat yourself on the back, lady, cuz you are amazing! Mine is sometimes clean for 15 minutes before my children come home from school while my son is napping, and a half hour after they go to bed it might just be clean as well. I have decided that is good enough for this stage of life. I would be miserable and ornery all the time if I didn’t lower my standards a bit while my children are small. There will be other seasons in life where I might get to enjoy a clean house all day. This is just not that season. 3- You are not the maid- so don’t act like one. Remember those first few children you brought into this world? Well, they should be old enough to start helping around the house by now. Hopefully, you already have them in house-cleaning bootcamp. If not, it is time to start. And here is a post where I talk about how to teach them to clean without ruining your relationship if you want more detail on that topic. But, this is a crucial period where they learn life skills that will bless them and those they will live with as an adult for years to come. Even if you can load the dishes faster, make the bathroom more sanitary, or even organize their room in 5 minutes compared to their 2 hours– don’t do it. Let them learn what they need to learn. Eventually, most kids will become quite skilled and helpful if you are willing to make it through the tedious learning process to get them there without doing it all yourself. Incidentally, this process is another reason remembering #2 is so important. I am happy to report that my 11-year-old is fantastic at unloading the dishwasher now. And my 8-year-old is so proficient in loading the dishes the way I taught her, I often can’t tell whether I loaded or she did when I open it up. Don’t be the martyr mom who does everything for everyone and secretly or outwardly resents it. And really, don’t even be the mom who does everything for everyone without resenting it either. You aren’t doing your children any favors by letting them spend hours with their Playstation while you clean up their messes. Someday they will thank you for teaching them how to take care of a house… Okay, maybe they won’t. But their future spouse will. 4- Involve your older children in the care of your younger children. It is good for them to help you. Obviously, they are not the younger children’s mother and they shouldn’t be left to attend to all of their needs while you surf the internet all day. But, a diaper change here and there throughout the week when you need it is completely reasonable. If they want to get paid to tend other people’s kids or have their own someday, they need to learn that skill. Helping entertain and care for their younger siblings while you shower or make dinner is also reasonable. Anything that helps them focus on meeting someone else’s needs instead of just their own is a good thing. It is so easy for our children to become self-centered and selfish in the world we live in. It is also easy for our children to spend so much time interacting with screens that they miss out on important relationship connections and character growth that comes through interacting face-to-face. Our children need to spend more time interacting with each other than with the screens in our homes. And serving each other is the very best way to help them develop empathy and charity in their hearts, while increasing the love that they feel for each other. You love who you serve. This is just true. And feelings of self-worth come from knowing that your actions are meaningful in the lives of others. There is a reason God put us in families where opportunities to serve and love are so abundant. 5- Think long and hard about what extra-curricular activities you involve your children or yourself in. Unless, of course, you enjoy being a crazy, frazzled mom who lives in her van running Katie and Joe to and fro, writing checks and doing fundraisers. You can read more about my thoughts on this here. When your neighbor is enrolling their kid in dance, piano, soccer, and gymnastics and you are feeling pressure to do the same, ask yourself– Is the value this will bring to my child worth the time it will take away from our family time and the stress it will add to my or my children’s lives? When you are asked to take on another commitment or feel tempted to jump into a new hobby, ask yourself- will this take away too much time from the the things that matter most right now at this stage of my life? The truth is, with 5 children, enrolling all of them in multiple extra-curricular activities is just not feasible time-wise, and, for most families, money-wise. So, look for things your children are passionate about and find ways to encourage them and foster growth in those areas. This doesn’t always have to be by joining a team or group. Don’t involve them in things just so they have an impressive resume. In the end, the time you spend together as a family will be far more valuable than the time you spend developing hobbies. 6- Have regular date nights. There is a good chance if you have 5 kids, you might have reached that blessed stage of life where you have a built-in babysitter. Gone are the days when a date night would set you back $30-50 just in babysitting fees. (Kind of makes you want to do a cartwheel just thinking about it, huh? But, don’t. Trust me. Don’t. You are too old for that. Take it from me.) Your eldest child can now take on the role of babysitter and save you a fortune. And you don’t have to call around to see who is available which is oh, so nice. We usually pay our oldest daughter a little something if the house is clean and the kids are in bed when we get home… but it is a very little something. Take advantage of this great blessing and have a regular date night with your spouse where you can have some adult conversation and get out of the chaos for a bit. Keeping your marriage strong is the one of the most important things you can do for your children- do not neglect it! Let your children see you make time for each other and express love for each other- it will give them a sense of security that is invaluable. If you are raising a large family on your own, my heart goes out to you. Take some time to spend time with friends or family on a regular basis- you will definitely need the break to keep your sanity and recharge. 8- Eat dinner together. It may not seem like a big deal– but it is. Studies have shown that youth whose families regularly sit down and eat dinner together have significantly lower rates of alcohol abuse, drug abuse, gang involvement, obesity, bullying, depression, and promiscuity, while having higher rates of self-esteem and higher GPA’s. So, make it a priority to sit down and eat dinner together as often as possible. The conversations and interactions that take place between family members around a dinner table will fill the need for love, connection, and support that might otherwise be filled in negative ways. Knowing what is going on in your children’s lives and feeling connected to them is important for us as mothers and keeping them away from destructive behaviors makes life as a mother so much easier. 9- Don’t compare yourself or your family to others. You have no idea what other families are like behind closed doors. They may have gone on 3 fabulous vacations this year and look gorgeous in their photos- but that doesn’t mean they don’t have their own struggles and challenges. Few people broadcast those to the world. You might wish you could go on their vacations, but you most likely wouldn’t trade their challenges for yours. And if you compare yourself to the woman who seems to be all things to all people, you will no doubt start to feel you just aren’t doing enough. Right now your first and highest priority is to be all things to your family- especially while they are young. It is okay to say no to the PTA, or anything else you don’t feel prompted to do, in order to make sure you are taking care of things at home first. If you save all the children in Africa, but neglect your own family to do it, you will have failed your most important mission in this life. Don’t leave your sacred work as mother to be done by someone else because you feel you are in a competition to be involved in a million different things like some other mom you know. Often, the most effective and most fulfilled moms aren’t the ones running in a million different directions, but the ones who have learned to take on less so they have time to appreciate the little moments with their children while they can. It is those moments that you share with them that will pay the highest dividends in your relationship with them into the future. 10-Prayer. I don’t know how I would survive as a mom without keeping a strong connection between me and my Maker. I need His help everyday to keep it all together. The closer I feel to Him the more patient I am with my children. So, I pray throughout the day. When I’m frustrated, overwhelmed, grateful, happy, sad, discouraged- I take it to all to Him and He helps me in my efforts to raise these sweet little spirits that were His before they were mine. And the most important thing I do with those sweet spirits everyday is gather them so we can pray to Him together. I learn so much from them when I listen to them pray. My stresses and frustrations melt into humility and gratitude when I hear their sweet, innocent, sincere conversations with their Heavenly Father at the beginning and end of the day. It is in those moments that I can see clearly it is all worth it and I wouldn’t want to live my life any other way. If all else fails and your feel yourself getting stressed or overwhelmed by the daily demands of motherhood, just shake it off! Here is my mommy version of Taylor Swifts “Shake it off” to help you do just that.